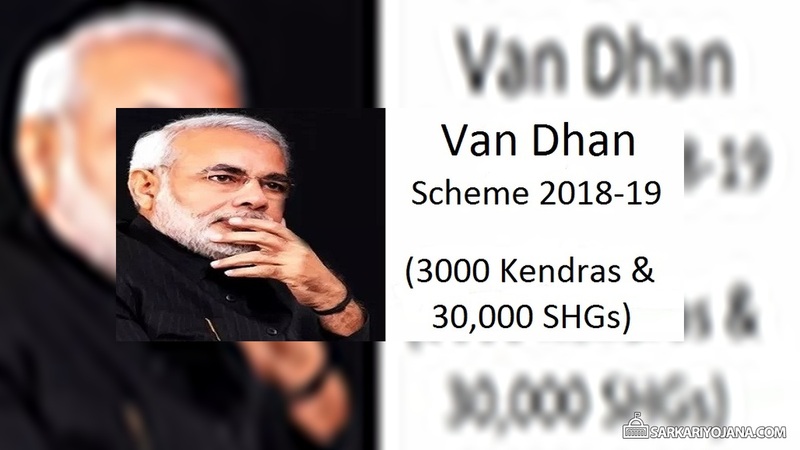 Central government has proposed to setup 3000 Van Dhan Kendras under Van Dhan Scheme 2018-19. Ministry of Tribal Affairs will establish 30,000 Self Help Groups across the entire country. The main focus is to harness the forest wealth (non-timber produce) of upto Rs. 2 lakh crore and to utilize it for the welfare of the tribal people through SHGs. In the first phase, govt. will launch this scheme in 115 aspirational districts and later it will get implemented in all tribal areas. This scheme will ensure that the benefits of value addition and appropriate prices are given to the tribal people. Govt. will implement it through a 3 stage value addition process resulting in the enhanced income for tribals. Van Dhan Scheme, Jan Dhan Scheme and Gobar Dhan Scheme are the flagship schemes of Modi government. PM Narendra Modi has launched this scheme on Dr. Ambedkar Jayanti on 14 April 2018 at Chhattisgarh. Van Dhan Scheme 2018-19 targets to generate livelihood for tribals. This is done through harnessing non-timber forest produce and to utilize true wealth of forest (Van Dhan). The forest wealth is estimated to be around Rs. 2 lakh crore per year. This mission will promote and hold the collective strength of tribals through SHGs to achieve scale. Van Dhan Scheme has a huge potential to empower the tribals. Govt. will focus on convergence with Panchayati Raj. Initially, govt. will implement this scheme in aspirational districts and then in the next phase, govt. will implement this scheme in all tribal areas. This scheme will focus on building upon traditional knowledge and skill sets of tribals. This will be done through adding technology and IT for value addition. In forested tribal districts, govt. will make every possible effort to set-up tribal community owned Van Dhan Vikas Kendras. Each such Kendra will comprise of 10 tribal SHGs in which each SHG will have 30 tribal NTFP gatherers and artisans. This will ensure around 300 beneficiaries per Kendra. Govt. has proposed to undertake grass root level procurement through SHGs in association of other Implementing Agencies. Other govt. departments will also work simultaneously to utilize the services of existing SHGs like Ajeevika. All SHGs will also be provided appropriate training on sustainable harvesting / collection, primary processing & value addition. These SHGs will work in clusters and thus will fulfill the stock availability in tradable quantity. Moreover, govt. will also provide them with a facility of primary processing in all of these newly established Van Dhan Vikas Kendras. Under Van Dhan Mission, govt. has already established 10 Self Help Groups each having 30 Tribal gatherers at Bijapur, Chhattisgarh. Govt. is providing training and working capital for value addition to the products collected from jungle. Collector will lead the group and will also assist them in marketing of products within states and also outside the states. TRIFED will provide training and technical support.